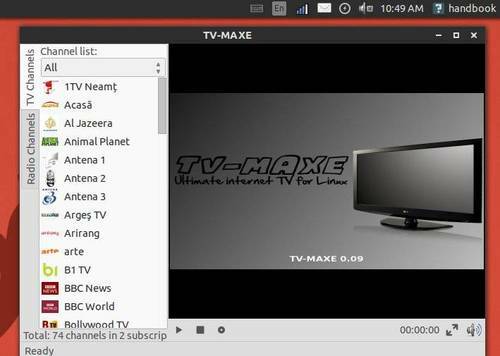 TV-MAXE is an app to watch TV stations and listen radio via different streams, such is SopCast. Now it’s available for Ubuntu 13.10, Linux Mint 16 in its PPA. Europa FM, Impact FM, Kiss FM, Magic FM, Naţional FM, PRO FM, Radio Iaşi, Radio Intens, Radio România Actualităţi, Radio România Cultural, Radio Vocea Evangheliei, Radio ZU, Rock FM, Sky FM Dance, Sky FM Top Hits, Vibe FM. not working in ubuntu 13.10 !!! in my old hdd with…13.04 …upgraded in 13.10…working !!! but…nolw… not !!! i have one new ubuntu 13.10 …but…i can not install tv maxe!!! why ??? after it is installed how do you “run” it? where is located the application? thanks.